Last time I posted a long essay for Wiley Wednesday talking about motivation and dedication, following one on balance-point. I’ll finish this series with today’s post on GOALS. – It’s crucial to find your internal/external balance-point in any creative pursuit. You have to know your limits in order to set realistic goals. – Your desires motivate your actions. The act of reinforcing your motivations is dedication. When you combine dedication and goal-setting, you get positive action – progress towards your ultimate desires. DISCLAIMER: As per usual, this is just my opinion, and one of an infinite number of ways to attack the task of goal-setting. If it works for you, that makes me gleeful. If it doesn’t, don’t blame me! Once you’ve gotten a handle on what motivates you, and you have your general compass-point (your desires/dreams) you are ready to set some goals. One method for doing this, is to think of your goal-plan like a pyramid. How many writers does it take to build a pyramid? borrow tools, rely on someone else’s strong back, consult other pyramid engineers – but if you aren’t dedicated to it, your pyramid will not get built. managing to complete one novel on top of raising two stellar kids. Whatever it is, dream big. I’m a firm believer that aspirations are healthy, as long as you realize that until you take positive action towards them, that’s all they are. Find a nice quite spot and set aside a good chunk of pressure-free time. Take out a blank piece of paper. At the top, write, “I want to be . . .” and then list off everything you can finish that sentence with. Now, these are dreams, so you’re allowed to be whimsical, of course. But, try to think of it in terms of WHO you want to be. Many of the things listed might be who you are, or strive to be, already. I want to be . . . Able to run three miles in fifteen minutes. Someone who speaks three languages fluently. A published author. The first person my friends think to come to when they’re sad. A teacher. A good role model for my nieces and nephews. You get the idea. This is a boundless exercises, aimed at getting you thinking about that pinnacle of your pyramid. What do you want to accomplish most? Who do you want to be? That is your pinnacle. Now we’re back to the first part of our formula: Goals. Goals are sorta like dreams – they are things that you want to accomplish, often as a means to obtaining said dreams. The difference is that goals are concrete. 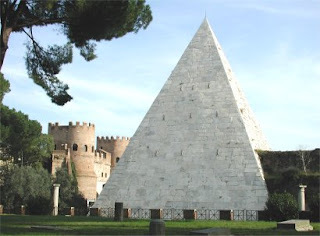 In our pyramid analogy, they are the concrete bricks we use to build the pyramid up towards our dreams. To work on goals, you need to pick one ‘aspiration’ or several that are tied together, and set that as a pinnacle to build towards. Let’s take my ‘I want to be a published author’ aspiration and expand on that. We’ll ask questions and add details so that it can start to take solid form – so that it can morph from dream to goal. What type of author? What genre? What length? Published where, by who and for what audience? Once I’ve determined that I want to be published in novel length fiction, in the paranormal romance genre, by a NY print house (maybe I have a top five list), then I’m almost there. Only one thing missing to make this goal solid by asking one question – when? You have to have something more definitive than ‘someday’. Someday is up in the clouds. We want to come down to earth. But we will answer this question after a little more self-exploration. Your goals are very personal. Just as your list of ‘I want to be’s’ is personal. Some goals can remain more abstract and you can still reach them, some can be very detailed. The most important thing in setting your goals is that you do set constraints on them – give them a solid form. Don’t leave them wispy and unformed – these are still dreams. It’s OKAY to have those – have LOTS of them, but don’t mix them up with goals. Your goal needs to have a who/what/where and a when. The why is personal, and the how is . . . well, the how comes later. Keep reading. So, have you built your top triangular brick – the pinnacle of this particular pyramid? Great! Now I’ve got news for you: goals come in multiples. Rather, they sort of spawn each other like rabbits. You have one main goal. Now we need all the other bricks that go underneath it – a wide foundation, growing smaller towards the top. You have two choices in planning your pyramid: top-down, or ground-up. It’s a matter of personal taste, so do what feels the most natural to you. Write your three-sided who/what/where goal at the top of the page. If you’re using top-down, think of two things you need that would be your last two steps towards that goal. 1 polished manuscript worthy of print, and an agent to land me a deal. 3. Feedback to help polish the manuscript. Note: If you have problems with this step, look at your top goal. It might be too general. And so on. Do you see how your goals branch out and get wider at the bottom? Sort of like a pyramid? Well, use your imagination. You can be as detailed or as vague as you want in this process, depending on how detail oriented you are. Some people will have 100 tiny bricks (steps) and some just need the 10 major ones to keep them on track. You might also find that some of your ‘bricks’ end up being the same, repeating, or inter-linking. That’s to be expected, if you’ve made your top brick concrete enough. Also, remember to make this subjective. They are always multiple ways of approaching a problem, and this is catered to you – what you need and want, what your strengths and weaknesses are. The main purpose here is to start seeing the pyramid take form. Maybe some of the bricks you have handled already – that’s terrific. You still need to know what they are and where they go. Maybe there are big holes in your plan and you have no idea what step goes there? Write the question you need answered in its place and below it, put finding a resource to have that question answered. The other thing you will hopefully see is that when setting goals, you can make them tiny manageable pieces, or more general. (Hopefully both.) Just make them concrete. Pyramids don’t get built overnight. Guess what – the ‘How?’ has taken care of itself! Look at your pyramid again – the how is what you’ve just done. Pat yourself on the back. The next step is where my previous post on Balance Point fits in. Be honest about your limits and knowing what you can accomplish. I’m not going to tell you: ‘if you really want to be a NYT best-selling author, you will take out a second mortgage on your house, quit your job and write the Great American Novel in the next year.’ Partially because I don’t believe that, and partially because I think that is a very unbalanced way of doing things. Whether your goal is to publish, or simply to complete a work, it shouldn’t come at the cost of other things and people important to you. KNOW YOUR LIMITS. have a TOTAL time required: 12 books at two books a month = 6 months. And remember, these are your best estimates and don’t have to be 100%. Many will be influenced by things out of your control. I guarantee they will ALL change. That’s okay. your pyramid can generally be done concurrently. Add up the longest time frame of each level. This is the minimum amount of time you need to prepare to reach that pinnacle. It might take longer than you initially anticipate, but as long as you keep building, you’ll get there. Setting goals will hopefully be easier when I can answer that question – surely! You don’t have to know it, Eaton. You can ‘feel it’. I’m sure you know *some* things you want to be . . . Just write the list like a free-flowing stream of consciousness. Sounds like a lot of work, but it’s undoubtedly true. Building anything requires effort and time. I often forget that fact and am disappointed when it doesn’t happen overnight. This is a very detailed and specific plan for success. And I can see how it’s worked for you. You’re destined to finish that pyramid, not because of fate, but because of your motivation and work ethic. Congratulations,:) and good job. You’re an inspiration.